“‘I love the idea of being able to go into my back yard and hop into my flying car,’ said Brad Templeton, a Silicon Valley entrepreneur who has served as a consultant on Google’s self-driving project. ‘I hate the idea of my next-door neighbor having one.’” San Francisco Chronicle, April 25, 2017. Figure 1. 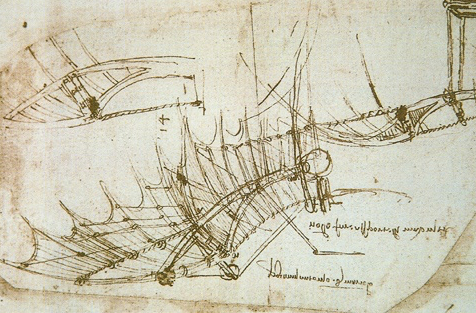 Leonardo da Vinci’s ancient dream of flying up-dated. Taken from GameModding.com. Figure 2. Detail of a wing by Leonardo da Vinci for his flying machine. An ancient dream. Can it be updated for today’s suburban and urban denizens. Drawing by Leonardo da Vinci, c.a. 1490. Could flying cars be some kind of joke in the age of fake news and high politicians saying something momentous, outrageous, insulting or just plain intentionally confusing to confuse what might be news, by claiming it was a joke? Or maybe not – you get to guess. Are we now entering an age in which the truth is hidden, mocked or otherwise ignored or abused, but most basically confused rendering the very search for “truth” a joke in itself? What’s going on anyway? Machiavelli said in his classic for tyrants, The Prince, that the prince must intentionally confuse the people, keep them off balance and in the dark about the intent of the prince, to better control them. And, by the way, the prince – read dictator these days – can rule either by the love of the people or by their fear. However, they love the prince on their own will but fear the prince at his will. Guess what the leader who is a prince or just a modern aspiring dictator prefers? There’s nothing like a leader who is unpredictable for stirring up fear, much less who’s off the wall. Don’t pay any attention to the man behind the curtain. Don’t pay any attention to the intent behind the statement. It’s a joke. Or is it? 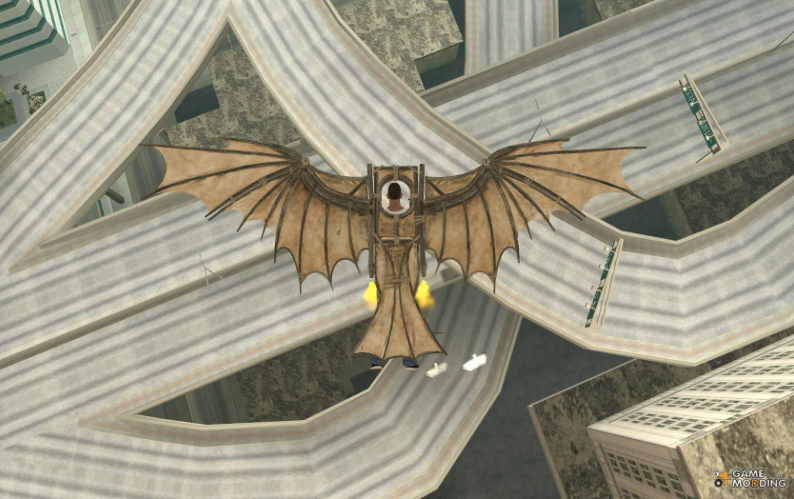 Is the flying car off the wall, or moving off the drawing boards into reality? In a seemingly less fantastic way, is the autonomous car in the same class: a joke or a brewing reality – or maybe just an expensive disaster enthusiastically squirming to be born? All these thoughts are implicit in the Chronicle article above cited and its follow up the next day: “Uber plans taxi in the sky by 2020” said the headline. You may not take flying cars seriously, as I don’t, except as some kind of dark distraction and threat, but Larry Page, a Google co-founder does, and he’s started a company called Kitty Hawk that is building prototypes right now. Then there is the French aerospace giant Airbus and several would be otherwise credible companies working on the project. Figure 3. 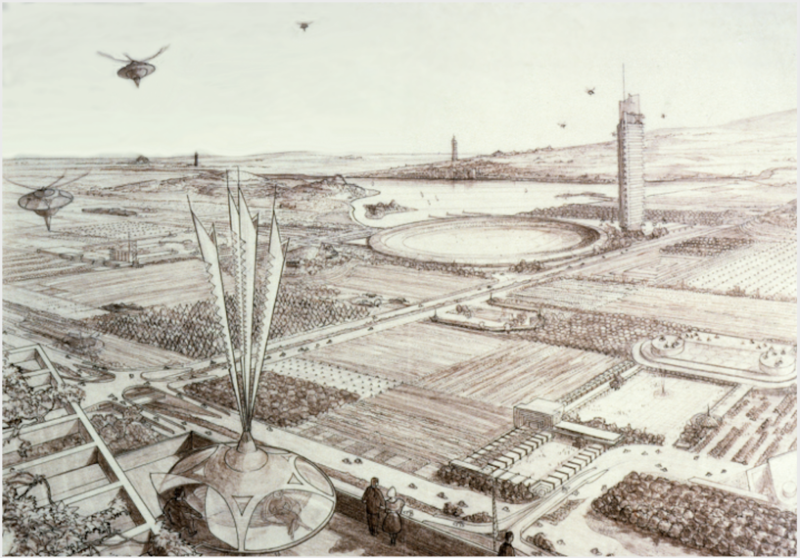 Frank Lloyd Wright’s Broadacre city. Wright was a magnificent designer of the single building but his city influence, as much as direct influence could be traced in the general mania for sprawl after the Second World War, was terrible. Here we see his version of flying cars. Drawing by Frank Lloyd Wright. 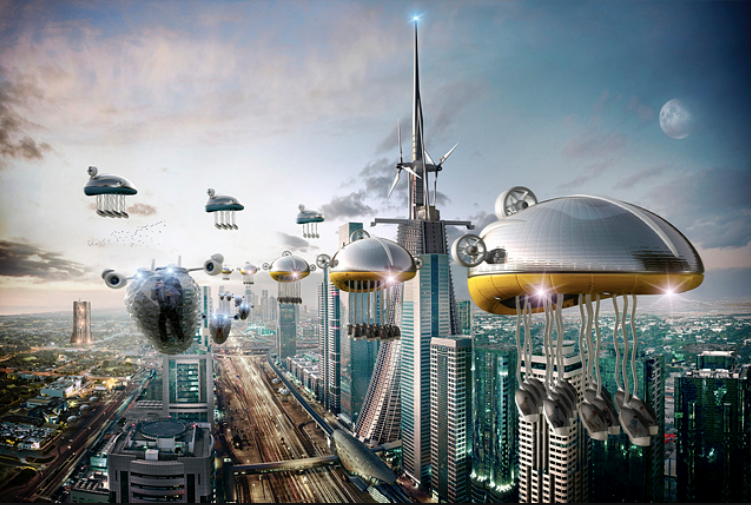 Flying cars, like driverless cars, plus other artificial intelligence, or AI, related technologies in early stages cluster together around another modern idea in discussion these days called “loss of agency,” which I think is as threatening as the technologies themselves being planned for broad application. I’m no luddite either, using my trusty two computers for email, research, writing, illustrating with Photoshop and I find myself frequently flying on big contraptions at 85% the speed of sound called Boeing 747s compromised as often trying to apply some high leverage for some good ideas to solve more problems than I’m creating. But one has to choose to what degree he or she has or loses skill, control and even useful intelligence of the squishy gray matter type as compared to rigid silicon. What about the loss of agency? If only temporary, maybe not so bad, especially if it doesn’t gobble up resources and poison the environment, change the climate and extinguish other species. But what about daily commuting, or taking to massively time consuming texting with no pretext of it meaning much of anything more than another habit likely as distracting as helpful or more so? Figure 4. 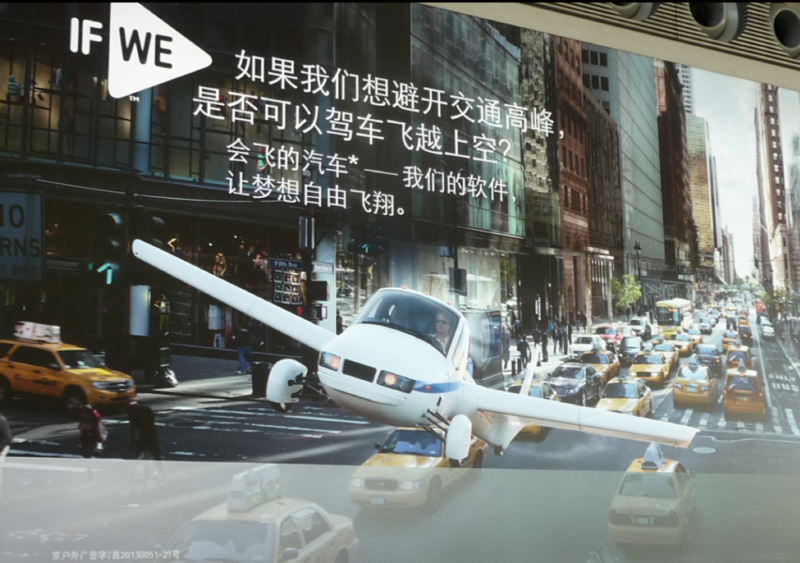 An advertisement seen at the Beijing Airport. Photo by Richard Register. Looking at another of the darling ideas of Silicon Valley – acknowledging at the same time many of their products are genuinely helpful in a big way – what about virtual reality, VR for those used to the idea or actually having tried on a headset or wraparound helmet? Interesting? To me the whole idea is boring: enter into someone else’s wraparound experience while not creating your own wraparound experience in the real world needing so much good work and offering so much good experience. I’d rather play the real reality game, RR instead of VR. (I like it also because those are my initials.) Be relevant with Real Reality! The self-driving car would represent a gigantic loss of “agency” in the world. Similarly I’m a little shocked that people would be incapable of steering themselves about town or between. Have they no basic skills, no pride? If you have cars you should know how to drive them, and well. If they are part of the reality you create you should learn to master them pretty damn well – then later for a better organized world. But don’t give up on yourself in the meantime, meaning don’t lose your capacity to control what you’ve committed to, even if some things are provisional, only for such and such a period of time. The alternative to all this bizarre abstracting yourself out of the real environment that provides food, air and water and the company and services and just plane awe of all those other living things we share the planet with, definitely aided in many ways by technologies we can choose to embrace or not, is to understand what is really needed. Not joked to be, but really needed. At this stage when so much of the world is losing its grounding in the basics, we need to understand food, clothing and shelter. We need to see these things in relation to a world undergoing rapid change in many obviously unhealthy directions as we approach that wall of resources collapse at some unknown point in the future when our demand exceeds the beleaguered planet’s ability to supply – if we don’t act (engage our “agency”) to make things truly more intelligent and healthier. Only then, when dirt-under-the-fingernails and sweat of the brow and under it in a mind trying to understand what we really need to survive and thrive, will we separate joke from what’s serious and helpful. Thinking like this there comes a time when you distinguish artificial intelligence for artificial irrelevance and choose not to, at the very least, waste your precious time and life away. Time to distinguish – and invest thought and effort and real physical resources and tools in creating – in helping build consciously and not with confusing joking, a better world. I have an image in a string of words I’ve used a few times recently, one that rather unites some of the problems of driverless cars and VR: “I know dear, let’s put on our VR helmets and take a nice afternoon drive in our driverless car. It doesn’t even matter where we’ll be going. So many more destinations are just fine that way…” Expand that a bit: “Lets put on our VR helmets, get in our driverless flying car and buzz about some.” That’s the new version of a nice Sunday drive. Figure 5.1. 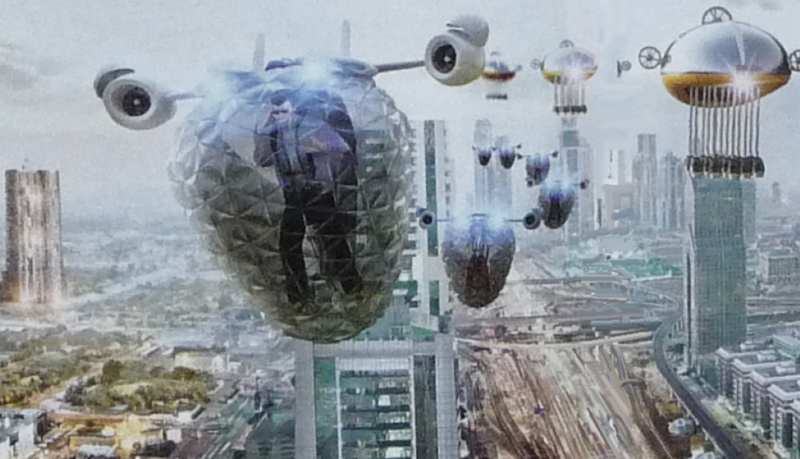 The commute doesn’t look like that much fun, science fiction style… From Mitchell Joachim, Wired Magazine. The point is worth driving home (not to over use the term “driving” but…): city form and transportation systems are integrally linked. Cars fit sprawl. Feet fit cities. The planners’ and citizen activists’ mantra should be: zone, layout and build cities for people, not machines, pedestrians not 3,000 pound sprawl crawlers, and crawl is what they do in traffic jams about as much as zip along the open road, driver’s hair rippling in the wind. This means, as I emphasize in most of my talks in the last three years, the better car makes a worse city. Feet, bicycles and transit make a better city. To go as far as ecocities, applying the best of design features, expect cities to be net positive contributors to healthy ecology and evolution. 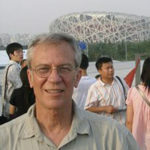 That confronts the major problems of our times in a very positive, big and practical way. Arup produced a set of very colorful and stylishly crafted pack of cardboard info flip cards called “Drivers of Change.” The little box of cards is one of their proudest publications featuring a dozen or so commanding concepts, problems or trends we should all be addressing as subjects of highest priority. Who is Arup: in their own words, “We are an independent firm of designers, planners, engineers, consultants and technical specialists offering a broad range of professional services. Through our work we make a positive difference in the world.” They design and build gigantic facilities like airports, sports stadiums like Beijing’s Olympic Bird Nest and 17 of the world’s tallest buildings as of their current website. Here is what they say about their deck of stylish, colorful, intelligent cards: “What will our world be like in 2050? Drivers of Change is a research-based publication developed by Arup to help its business affect our world in the future.” Here’s what they feature as their drivers of change: climate change, convergence, demographics, energy, food, oceans, poverty, urbanization, waste and water. They forgot the driver, the car driver, shaper of our cities, largest creation by far of us human beings with a gigantic, way outsized impact on the world’s total environment from the driver’s impact on climate and extinction rate to daily lifestyles. Figure 5.2. …especially if you zoom in to imagine the taking to the crowded skies if the alternative is ever taken seriously. 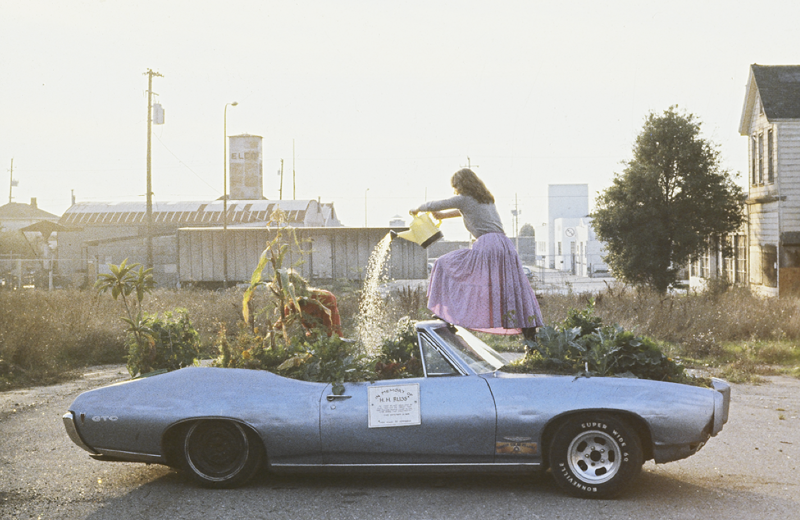 This image appears under the label “Ecotopia.” I can guarantee you that one of my best friends, Ernest Callenbach, now several years departed, author of the novel Ecotopia would have thought this image about as opposite his vision of an ecologically healthy city imaginable. It is a hopelessly fanciful image too in that without anti-gravity machines the vehicles are radically too small for balloon lift and wing area far too tiny for support. In addition, the isolation of the individual is nightmarish and highly contrary to the friendly character of his characters his great underground classic of the earthy green counter culture, 1970s and 1980s. Still many great ideas for cities and towns therein. A slight refinement for this article: that includes cars that fly, steer themselves and relieve the driver from actually mastering the basics – with transportation in this case – of agency in his or her daily world. So when we dream of our future cities and as we go about our transportation choices we get to choose a world we want because cities are massively big and consequential. What will it be?